Yep, it’s that time of year again. Pumpkin season. I’m not going to lie, “pumpkin-spice” season kind of makes me cringe. I feel like a pumpkin-spice bomb goes off i the U.S. during this time and doesn’t go away until January and I’m just ‘meh’ about it all. I think I overdosed on pumpkin-spiced lattes during college and now i’m just not very into it. I will say though that pumpkin sans “spice” is something I love! I love the sweet and mild flavor of pumpkin in general, I just don’t like it muddled with all the spices in my pantry. 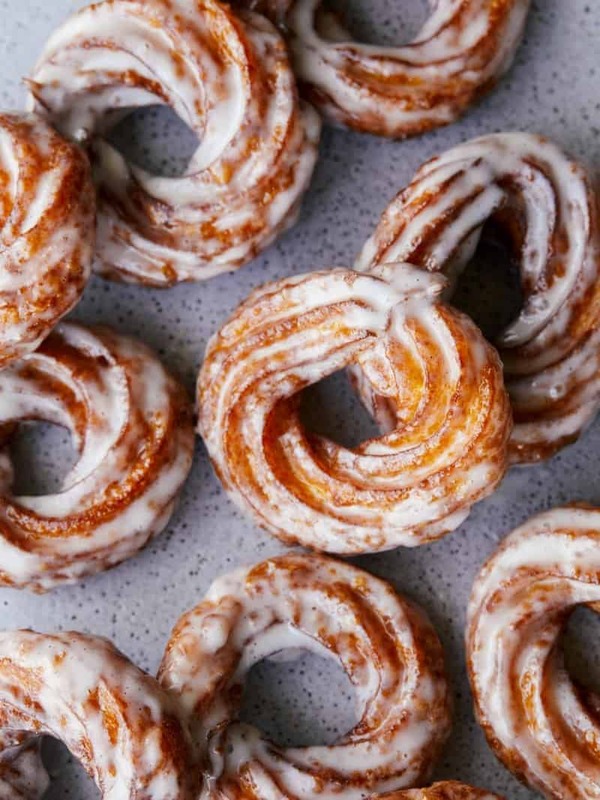 These Pumpkin Crullers are the perfect ‘pumpkiny’ type dessert where the natural flavor of the pumpkin pokes through and blends well with the rich vanilla-bean glaze. 1. In a medium pot bring milk, water, butter, sugar, salt, and cinnamon to a boil, over medium-high heat. Stir in pumpkin and continue to boil. Lower heat to medium-low, add flour and stir together with a wooden spoon. Continue to stir together, for 4 to 5 minutes, to ensure raw dough flavor has been cooked out. Dough should lift from bottom of pot easily. 2. Transfer dough to a stand mixer, fitted with a paddle attachment, and beat until all steam dissipates, 3 to 4 minutes. 3. Once dough has cooled, add eggs one at a time, allowing each egg to mix in completely before adding the next one. Finally add egg white and continue to beat together until a thick, sticky batter forms. 4. Cover batter and refrigerate for at least one hour and up to 1 day. 5. Cut 16, 3”x 3” squares of parchment paper and set aside. 6. Fill a large pot with 3 inches oil and heat to 350˚F. 7. Fill a large piping bag, fitted with a large star tip, with batter. Pipe a cruller ring onto each cut square of parchment paper. 8. Once oil is hot, carefully place a cruller into the hot oil, parchment side up. Once cruller is in oil gently peel parchment away from cruller, with tongs, and discard. 9. Fry cruller for about 4 minutes on each side, or until golden brown. Transfer cruller to a baking sheet, fitted with a cooling rack. Repeat until all crullers have been fried. 10. Glaze: Place all ingredients into a mixing bowl and gently whisk together until smooth. 11. 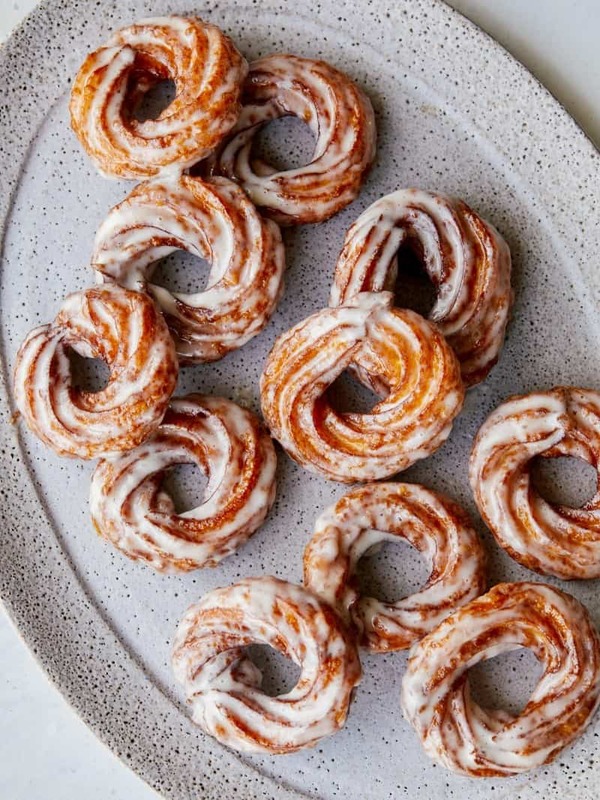 Dip each cruller in vanilla bean glaze, or pour glaze over crullers. Allow crullers to sit for 15 to 20 minutes or until glaze has hardened. Serve.